One of Hyperion's first successes from the early '80s was an LP of this title recorded by The Philharmonic Choir under David Temple. Subsequently transferred to a Helios CD, it was later deleted because the recording was pre-digital and the duration rather short measure for a CD. We still get many requests for it so we've re-recorded this enlarged programme which again contains many favourites made famous by the Glasgow Orpheus Choir, founded in 1901 by Sir Hugh Roberton and disbanded in 1951 upon his death. The choir made dozens of records for HMV and is remembered with affection by many people. The music includes many folk and traditional songs from England, Wales, and particularly Scotland, as well as well-known pieces by Elgar, Parry, Stanford, Sullivan, Warlock etc. All are marvellously sung by this superb choir. In 1901 in the city of Glasgow a young funeral undertaker and self-taught musician was appointed conductor of a mixed-voice choir attached to a working-men’s club. Early in 1906 the choir asserted its independence and became the Glasgow Orpheus Choir. At the time of its final concert forty-five years later its international renown was assured and its place in the affections of the music-loving public unique. Today, its influence on the development of partsong singing is seen to have been profound. All over the world choirs have been formed in its image and the standard it established acts as a stimulus to countless choral bodies. 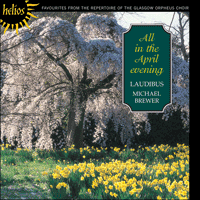 As this recording was conceived in respectful remembrance of the Orpheus—as it came to be known—and comprises choral pieces imperishably associated with it, it would seem apposite to amplify the story of the choir’s origin and career and to describe the development of its repertoire. In doing so, one point should be clarified: the repertoire was much wider than the extent of recordings by the Orpheus suggests. By and large, public recollection of the choir is confined to a relatively small number of pieces of immediate sentimental, poetic or rhythmic appeal. It has been forgotten that the Orpheus gave many first performances and regularly sang partsongs and motets by such composers as Elgar, Brahms, Bach, Bruch, Bantock, Cornelius and Parry, as well as liturgical works of the Roman Catholic and Russian Orthodox Churches. At the outset of the choir’s existence, and for a few years thereafter, its repertoire was limited to the run-of-the-mill partsongs, folksong arrangements, glees and so on, which were the staple amateur choral diet of the time. It was not long until these began to prove inadequate to the choir’s developing technique and aesthetic awareness. In particular, the folksong arrangements were hymn-like in texture and little more than exercises in four-part harmony. Thus it came about that the conductor was prevailed upon to start composing and arranging himself. As it happened, coincidentally, Marjory Kennedy-Fraser was revealing to the world the wealth of Hebridean folksong, and composers like Granville Bantock were inspired to make choral arrangements of them. Most of these were written with the Orpheus in mind and were first performed by them. At the same time, the rapid growth of the competitive festival movement in the North of England was encouraging the development of choral technique, and the demand for more and better music was being responded to by composers of the calibre of Elgar, Holst, Parry and Vaughan Williams. Thus the works of these composers came to be woven into the strand of the Orpheus. In the end, however, it was the popular and well-loved pieces which survived in human rememberance and this recording is a small anthology of these.